Item # 281016 Stash Points: 2,799 (?) This is the number of points you get in The Zumiez Stash for purchasing this item. Stash points are redeemable for exclusive rewards only available to Zumiez Stash members. To redeem your points check out the rewards catalog on thestash.zumiez.com. 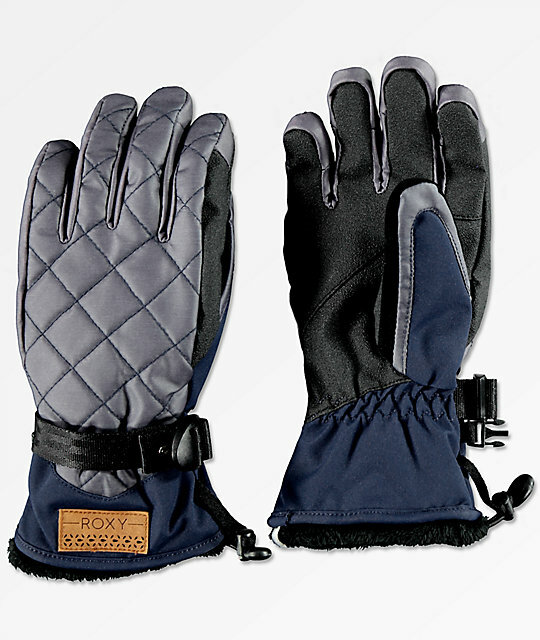 Roxy's Merry Go Round Peacoat Snowboard Gloves offer a sleek design and low-key color scheme that will look good with any outerwear kit. The Dryflight® exterior is backed with a durable water repellent coating for additional defense against moisture while the textured PU palm keeps these snow gloves durable and user-friendly. The Mery Go Round Snow Gloves feature a matte metallic upper in quilted blue with standard peacoat navy throughout finished with faux fur sleeve cuff trim for superior warmth and comfort. Merry Go Round Peacoat Snowboard Gloves from Roxy. 100% cotton jersey & twill polyester blend w/ Durable Water Repellent (DWR) to prevent moisture saturation. Dark peacoat navy blue w/ matte metallic quilted upper. Palm: A durable black PU palm is textured for grip and offers additional water-resistance. WARMFLIGHT®: 170-grams of Roxy's low-bulk, lightweight synthetic insulation that resists moisture in wet conditions while trapping in heat. Warmth Rating: 3 out of 3 - Roxy's warmest and coziest protection from the cold. Roxy 17/18 Women's Snow Gloves & Mittens. DRYFLIGHT® Insert: Provides long-lasting weather protection including an optimal moisture & temperature management. HYDRO-TEX&REG;: An extremely breathable, thin and lightweight waterproof membrane provides unsurpassed moisture management and warmth. Nose & goggle-swipe panel on thumb. Ergonomically-correct curved fingers & palm for optimal dexterity. Liner: Faux fur at cuff is met with brushed tricot lining for warmth & softness without sacrificing mobility. Cinched elastic cuff w/ adjustable webbing wrist strap.